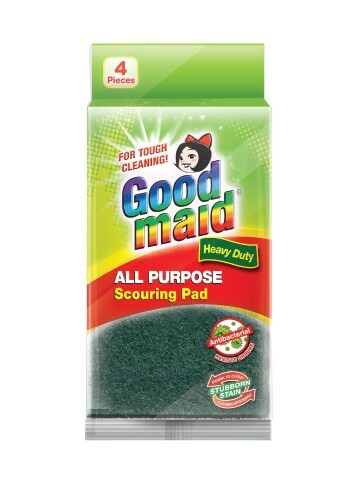 Scouring Pad - Goodmaid Chemicals Corporation Sdn. Bhd. For cooking pots, stove burners, broilers, garden tools and grills. • Good for tough indoor and outdoor clean jobs. • Antibacterial agent helps to resist odours for more hygienic cleaned area. • Rinse scouring pad thoroughly before and after each use. • Do not use on non-stick pans, plastic bathroom suites, enamel or any other delicate surfaces. For cleaning and removing burnt cooking remnants stuck on base of cooking pot & pans.